Niels Jensen’s The End of Indexing: Six structural mega-trends that will threaten passive investment (Harriman House, 2018) is a wonderfully thought-provoking book. It tackles macro issues that threaten not only passive investment but much active investment as well. Whether you agree with Jensen or not, and on most points it is hard not to, he will inspire you to rethink your long-term investing strategy. The six mega-trends that Jensen analyzes are: the end of the debt super-cycle, the retirement of the baby boomers, the declining spending of the middle classes, the rise of the East, the death of fossil fuels, and mean reversion of wealth-to-GDP. No, he didn’t ignore automation; he just didn’t want to include it as a mega-trend because he wasn’t sure of its economic ramifications. And so it remains an important thread throughout the book but one with more questions than answers. Here I’ll take a quick peek at the last mega-trend, mean reversion of wealth-to-GDP. Jensen’s thesis is that “certain ratios have well established mean values, and the long-term mean value for US household wealth-to-GDP is about 3.8 times. In other words, if wealth-to-GDP is much different (as it is now), it will probably revert to the mean over time.” In recent history, the ratio hit 4.8 in 2000, fell back to 3.6 after the bear market of 2001-02, then went back up to 4.7 before getting decimated during the Great Recession, and as of the end of 2017 reached a whopping 4.9. The wealth-to-GDP ratio can be understood as a capital-to-output (or capital efficiency) ratio, with wealth as capital and GDP as output. The lower the ratio, the more efficiently a country utilizes the capital at its disposal. So right now the U.S. isn’t using capital efficiently. How should an investor structure her portfolio if she believes Jensen’s analysis? Jensen is a long-term investor, so he is not prescribing a short-term fix. In fact, he says, “if my recommendations work well in the near term, it will be down to luck more than anything else.” But, after reviewing four types of risk—beta, alpha, credit, and gamma—he is most inclined to focus on gamma risk. Examples of gamma risks are the factors (e.g., volatility, momentum, income, value, and size) in factor-based investing. The gamma risk factor offering the most attractive risk premium at the moment, he believes, is illiquidity risk, such as investing in music royalties. I’ve barely skimmed the surface of Jensen’s book in this review. It merits reading and re-reading. And trying to take the other side of his arguments. 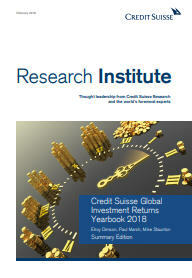 Elroy Dimson, Paul Marsh, and Mike Staunton of London Business School and authors of Triumph of the Optimists (Princeton University Press, 2002) are responsible for the marvelous Credit Suisse Global Investment Returns Yearbook, now in its nineteenth annual edition. The yearbook was distributed to Credit Suisse clients and is not for sale to the general public, but a 40-page summary of the 251-page yearbook is available online. The authors worked with 118 years’ worth of data. So this is no year in review; it’s 118 years in review, complete with myriad tables and graphs. Divided into five chapters, the yearbook covers long-run asset returns, risk and risk premiums, factor investing, private wealth investments, and 26 individual markets (23 countries plus world, world ex-USA, and Europe). Butman & Targett, New World, Inc. Think back to what you learned in school about the first English settlers in America. Yes, the Jamestown settlement predated the Pilgrims’ arrival, but it never really captured our imagination. After all, Jamestown had a rocky time of it, with over 80% of the colonists dying in 1609-10. The moralistic storyline of the Pilgrims, however, became an integral part of our own national story. We learned that the Pilgrims had escaped religious persecution in England and (with their stay in the Netherlands often glossed over) decided to start a new colony in America, that they sailed on the Mayflower and landed (or probably didn’t) at Plymouth Rock. New World, Inc.: The Making of America by England’s Merchant Adventurers (Little, Brown, 2018) by John Butman and Simon Targett recounts how, with both the crown and individual investors in dire need of new sources of revenue, the possibility of trade with faraway lands became alluring. The book begins about 70 years before the Pilgrims sailed, when England, “a relatively insignificant participant in world affairs,” faced “a daunting array of social, commercial, and political problems: rising unemployment, failing harvests, a widening gulf between rich and poor, and a crisis of leadership.” It was not certain whether the country could even survive. New World, Inc. is a fascinating account of both entrepreneurial risk-taking and the risk-taking of those men who set sail for unmapped destinations. The merchants often lost money; the sailors, their lives. And yet investors kept investing, sailors kept sailing. One would like to say that Plymouth Colony was the vindication of all of these losses, but no. The Mayflower returned to England with nothing of value, and most of the investors eventually sold out of the Mayflower venture. What are the four behaviors that transform ordinary people into world-class leaders? This is the question that Elena L. Botelho and Kim R. Powell ask and answer in The CEO Next Door (Currency / Crown Publishing, 2018). From a database of more than 17,000 CEOs and C-suite executives, they analyzed over 2,600 leaders. They coupled this analysis with 13,000 hours of interviews and two decades of experience advising CEOs and executive boards to distill the common attributes of successful CEOs. Those who reach the top are decisive, opting for speed over precision. They engage for impact, understanding exactly who their stakeholders are and what they want. They exhibit relentless reliability, delivering consistently. And they adapt boldly, riding the discomfort of the unknown. These behaviors, it is important to stress, are not inborn traits but habits shaped by practice and experience. Decisive CEOs, the authors not unexpectedly found in their study, were twelve times more likely to be high performers. So, what are the keys to being an effective decision maker? Three things stand out: making decisions faster, making fewer decisions, and putting in place practices to get better at decision making. Adaptive CEOs are willing to let go of approaches that have worked before. Otherwise, their companies may end up like Kodak, where in 1975 a young engineer developed a digital camera but the company did nothing with it, or Blockbuster, which had three chances to buy Netflix. The authors illustrate their points with stories about and interviews with CEOs.